Recently, we had the honor to work on one of the most unique homes in San Diego. 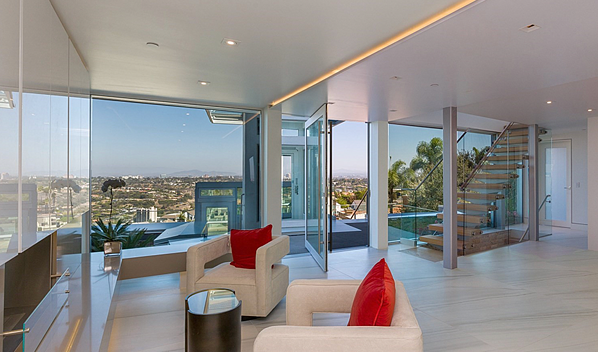 The property features a large amount of glass features, many of which are Cover Glass systems. 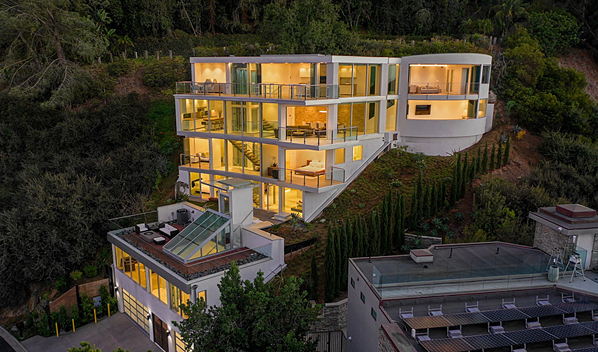 The first thing you’ll notice when you see the home from an aerial view is that most of the exterior is frameless glass. This allows the homeowners to take advantage of natural light all day long and enjoy spectacular sunsets in the evenings. The bed in the master bedroom faces out toward a frameless window offering fantastic views of La Jolla. As the Cover Glass system seals completely, it is comfortable in the room even when the weather turns cooler. Thanks to the stacking glass panel system, the family room can expand out onto a balcony. Best of all, the flush tracks mean that there’s nothing to step over, allowing the outdoor room to really be an extension of the interior. This picture shows one of the two rooms that uses curved glass. It would be impossible to create sliding glass doors in this shape using a traditional bottom-rolling system. 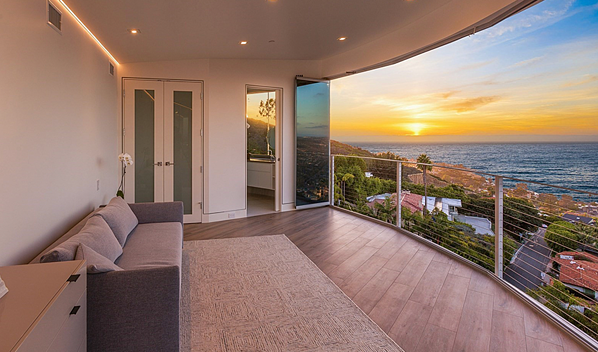 The sunset image allows you to appreciate just why the architect decided it was necessary to incorporate curvature glass into the design. 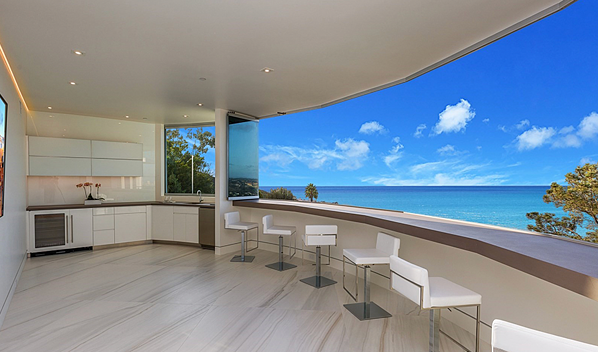 The second example of curved glass is this space, a room that doubles up as a lounge and sports room. If you take a closer look at the color of the glass, you’ll see that it is light blue to match the ocean and the sky. 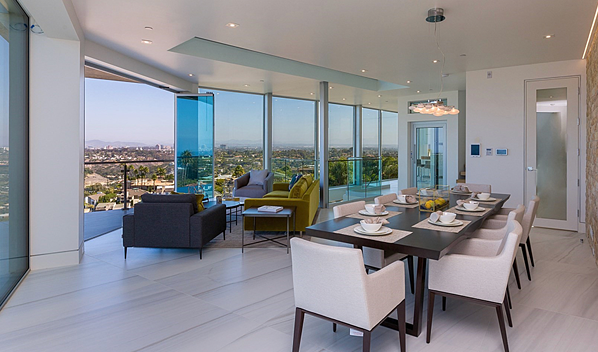 This joint living room–dining room is another area that makes use of a balcony. The difference here is that the balcony and interior remain as separate spaces. Still, when the glass panels are open completely, they let in plenty of fresh air in. The home also uses Cover Glass systems for its interior decor. For instance, when the homeowners shut the sliding glass panels, a glass enclosure is created. When they stack the panels to the side, they create an open space. This means the interior is flexible and suits the homeowners’ needs at any given moment. 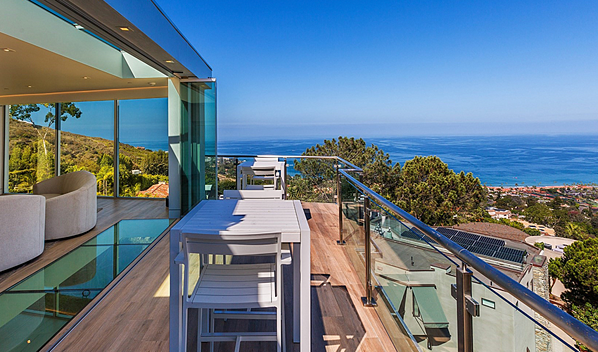 Furthermore, the choice of silver tracks for the sliding glass complements other aspects of the interior design. Before we leave, let’s take one last look at the home — this time, during the day. 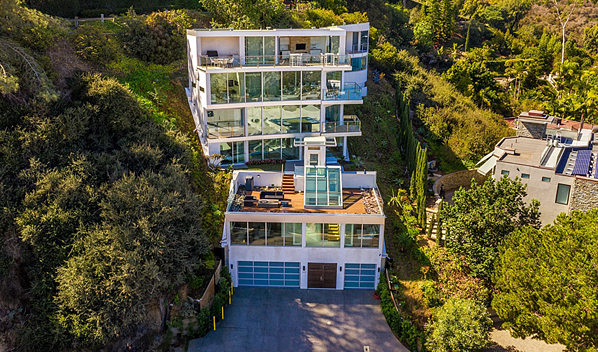 You can see that the location of the home and the precise use of the Cover Glass systems mean that the homeowners maintain privacy and take full advantage of the natural light and views. Want to Explore More Stunning Projects?